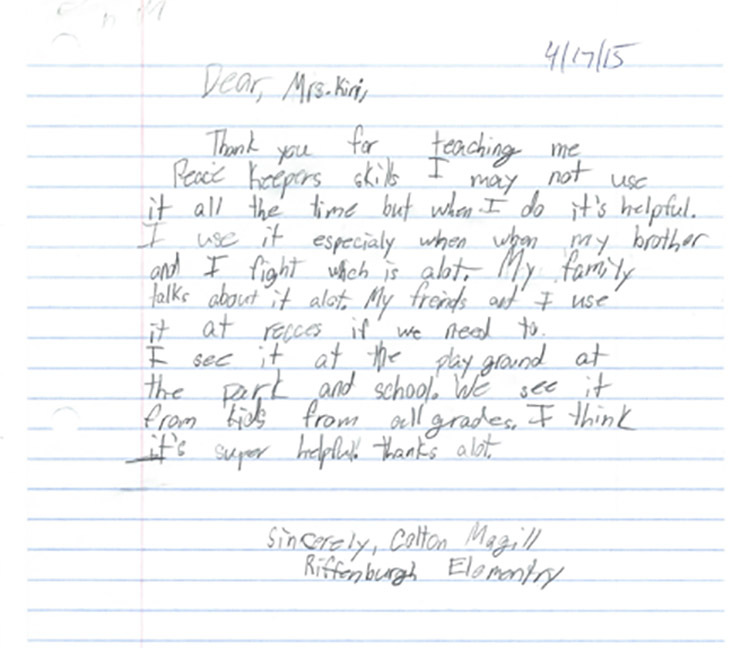 "I feel that by doing Peacekeeper in my room that it helps to build community within my classroom. I benefit from that all year long." Become more understanding to others situations and tend to care and be responsive to needs. Research shows that when basic emotional needs are met, classrooms are more productive and the learning environment is enhanced. Schools are moving away from punitive discipline toward Preventive Restorative Justice models. PeaceKeeper Circles are a perfect experiential companion to other behavior curriculum. Restorative Practices involve more than conflict resolution, making amends, and healing harm. R.P. encompasses a new paradigm, which requires deliberate actions to build respectful relationships and results in the creation of a compassionate, caring, cohesive community. Classrooms are an ideal place to develop relationship-building skills with people from differing backgrounds and perspectives. We decided to implement Peacekeeper practices as a proactive approach to teaching children the tools and strategies to resolve conflicts in a respectful, peaceful manner. Additionally, Peacekeeper practices supported our school’s mission around student leadership. Specifically, by teaching children tools to seek first to understand through mediated dialogue, they gained an awareness of how to maintain or strain friendships. In the first year we implemented Peacekeeper practices, our office referral data showed significant improvement. Teachers and students learned strategies to problem-solve conflicts in a proactive manner. As the year went on, children were able to problem-solve friendship or playground issues independently with a small amount of guidance from teachers. Students learned to resolve conflicts in a more peaceful manner, rather than letting hurts build up over time which tend to lead to more volatile resolutions. Second, we implemented a school-wide procedure for “refocuses” that gave students time to reflect on a poor choice or an action that was fairly low-level that disrupted their learning. These small level issues were handled in the classroom and not referred to administration to help problem-solve. This Fort Collins, Co. school uses the National PBIS statistical charts to track referrals. The whole school is now using Peacekeeper circles in all classrooms and what the stats show are that their referral rates have dropped significantly in a one year period of implementation using Peacekeeper and the refocusing procedure. They are very proud be in the less than the 25th percentile of those reporting. Laurel 4th grade teachers piloted Peacekeepers Circle in 2014 with ongoing support from Kiri Saftler. As they shared their successful experiences and positive impact on students with their teaching peers, it was a unanimous decision by the Laurel staff for Peacekeepers be a school-wide initiative. 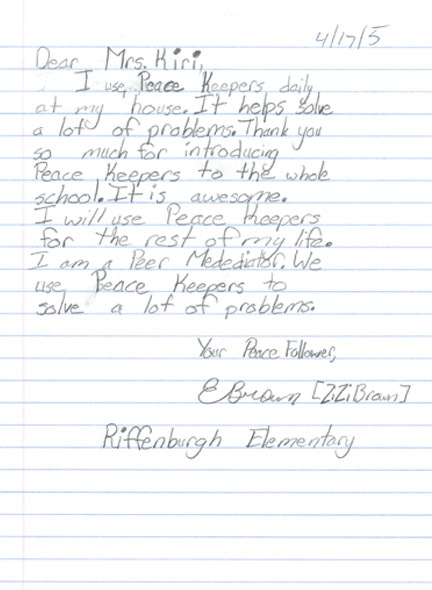 During the 2015-16 school year, all 1st grade – 5th grade teachers were trained by Kiri to implement Peacekeepers Circles in their classrooms. We had great success with those who implemented Peacekeepers as recommended and modeled by Kiri. Students in these classrooms experienced increased learning time, and teachers experienced decreased time lost teaching due to facilitating conflict resolution in the classroom. 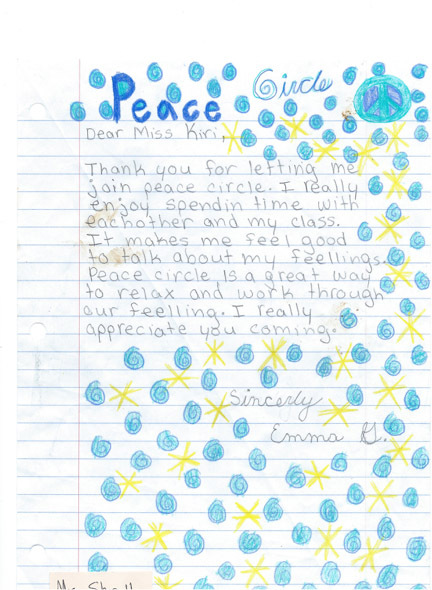 In turn, limited success was noticed in the classrooms of teachers who were less consistent with implementing Peacekeepers Circles. Students in these classrooms often had repeated conflicts during unstructured time such as lunch and recess, as well as in the classroom. I appreciate that Kiri recognized the need to differentiate her training to meet the needs of individual teachers as well adjust training to meet the unique dynamics of each classroom. Kiri was wonderful about offering support to all teachers in the manner in which they best learned. She was always respectful of teachers’ time, comfort level, and implementation status. I noticed, over the school year, that students understood what, “use Peacekeepers words” meant and felt comfortable sharing their hurts and concerns when they encountered conflict. Most students were very responsive and responded appropriately when prompted to resolve their conflicts with Peacekeepers routines and language. I believe many conflicts were resolved with simple prompting, which minimized disruptions to learning in the classrooms, and increased time for students to play and be active during recesses. In January 2016, Kiri trained Kindergarten teachers and supported the implementation of Peacekeepers Circles in their classrooms. We weren’t certain 5 year-olds were ready for using Peacekeepers, but teachers reported it was highly effective with Kindergarteners and were pleased to begin building their capacity for engaging in conflict resolution at a very early age. I love that Peacekeepers explicitly teaches and gives students language skills to share hurts and concerns, to respond appropriately when someone shares their feelings, and how to move forward to resolve conflicts. It’s beautiful to see students use these skills and know they are empowered to share their feelings, as well as have success experiences resolving conflicts respectfully. I highly recommend Peacekeepers Circles for any school community seeking ways to help teach students how to manage conflict safely and respectfully. Kiri is a trained Circle Keeper and Facilitator for Community and School Peace Circles, Circles Of Ten, Restorative Justice, and Peacekeeper. Since 2003 , she has been facilitating small and large groups in a variety of settings that include elementary–high school, workplaces, private groups, corporations and religious settings. Her passion is adapting modalities to fit the needs of the group with whom she is working. By training adults and students in the art of facilitation, Kiri keeps these circles spiraling out through the community. Kiri has a Masters degree in Spiritual Direction, or “Spiritual Companioning”. Preferring the latter term as she does not "DIRECT", she is a companion on the Journey. 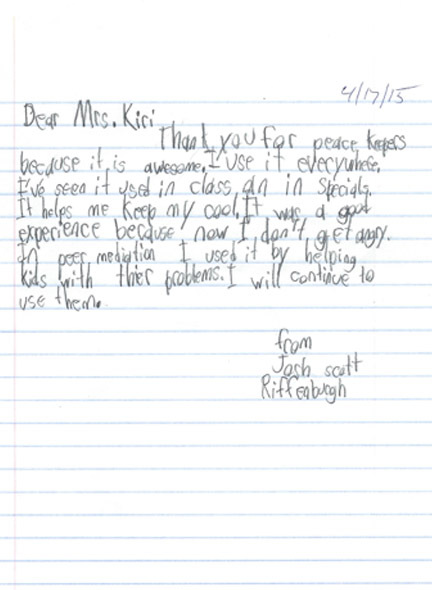 Kiri's compassionate listening offers a safe and sacred environment of reflection and encouragement. She assists with discovering the mysteries of life and what one is learning. She coined the phrase,“Mystery Loves Company”. Kiri's focus is on Inter-Spiritual acceptance, and respect, while honoring and appreciating all spiritual paths. 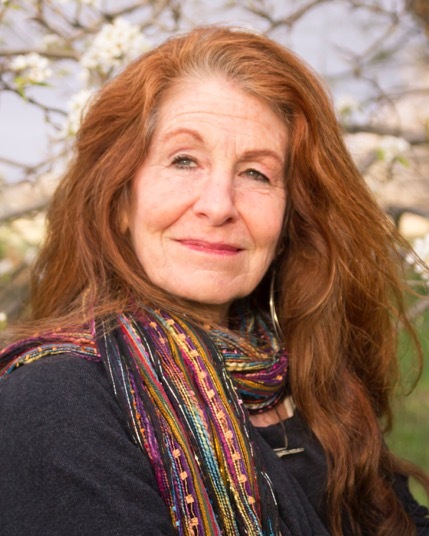 In her private practice she “walks the path” with and supports the unique journey of others who are interested in experiencing more internal and external peace and recognizing the genuine spirituality of everyday life. A core expression in Peace Circles is “what we focus on grows”. If this is true, Peace Circles are a way to focus on being internally peaceful and radiating that peace to the world. This would seem an appropriate career choice for someone who has been fondly referred to as “Kiriosity”. Her lifelong spiritual passion has been inquiry and searching about our human inter-connectedness. "I have experienced that when people find a sense of peace in their lives, they are more at ease with others and function with more respect in the world. Having peace in our hearts and relationships helps most people feel fulfilled. I feel privileged to witness amazing transformation in peace circle settings which gives me hope for humanity. Having hope is important for future generations. As a grandmother, I want to teach communication and connection with all our relations so our children will: "treat others as they wish to be treated." This commonly accepted phrase taught by most faith groups (and anyone teaching respect), arises unsolicited in Peace Circles because it so readily bridges all boundaries and gaps between people. When people have a chance to look into the eyes of another and speak from their heart magic happens and healing takes place." In addition to being passionate about Peace Circle Facilitation, Kiri loves being a Mother, Wife, Grandmother, Gardener, Artist, Event Planner and Decluttering Assistant. Autumn excitement about PeaceKeeper successes in Fort Collins, Co.
ALL donations are gratefully received and will go directly to funding training of Peacekeeper Circles for Elementary School classrooms and teachers.